You have a mobile website because you know how incredibly important being mobile accessible to your customers has become. Now you’re all set for mobile, right? Not exactly. Having a mobile-friendly website is probably the most important component of your digital strategy, but don’t be fooled to think it ends there. Over the years you’ve invested time and money into your digital offerings but, if you’re not monitoring those assets and altering them to fit your customer demands, you may be better off not being online at all. There are multiple areas where customers can interact with your dealership from a digital standpoint. Are all those areas catering to a mobile-centric experience? Let’s look at each area one by one to understand the importance of mobile to your customer’s experience. As of November 2016, mobile website page views surpassed page views from a desktop browser according to web analytics firm StatCounter. What does this mean? Your customers are on their phone more than their home PC. 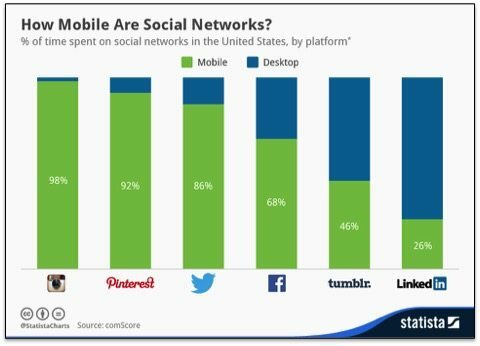 And the shift is moving more and more toward mobile every month. If you’re website is not designed to be viewed on a mobile device at this point, you’re way behind and most likely are losing potential new customers every single day. Most dealers today have a good mobile site. Customers can find your contact information, view your inventory, find events, submit service requests, etc. This is obviously covering all your mobile basics. I would urge you to look at your monthly analytics report. View reports that show you traffic to your website from desktop versus mobile device. If your mobile is not more than 50 percent of your site traffic I’d be shocked. Also, look at the most-viewed pages. Make sure these pages are not just mobile-friendly but do they have calls to action or experiences that let customers know there’s more information available and where they should go to get that information. Consumers can’t consume if they aren’t given the opportunity. Email marketing is still very popular for the powersports industry, primarily because it’s very inexpensive. It’s a very viable channel to reach customers through though. Unfortunately, many dealers emails I see are not designed for mobile consumption. Stats show that more than 56 percent of all emails are read on a mobile device. This number is expected to grow to 75 percent and higher but 2018. Are you cramming every possible thing into your email communications in hopes that a customer will read all of that information? It’s not working I assure you. If you’re doing email marketing with a 3rd party tool like Constant Contact or something similar you no doubt have access to reports and analytics on open rates, click rates, etc. Use these reports to refine and improve your email strategy. Stop trying to load up a months worth of marketing into a single email blast. Consider your audience and the device they are most likely viewing that email on. The small screen requires that you be more selective about what you’re sharing and be more direct on what you expect from the customer. You understand that more than 50 percent of your website traffic is coming from a mobile device, so it shouldn’t surprise you that more than 80 percent of social media traffic is coming from a mobile device. Many dealers rely on social media channels in a tremendous way. When you’ve invested time and energy to keep customers updated on things through Twitter, Facebook, Instagram, etc., are you offering a mobile-friendly experience by giving them links and directives back to your website or other digital resources? It’s not enough to just post updates on social media. You mustkeep in mind those customers are mobile and must be given a mobile-friendly experience. Social media platforms offer incredible analytics for your customer engagement. Facebook alone provides detailed metrics that are invaluable. Look at the mobile customer with the tools you’re given and alter our strategy to cater to your customers better. In 2015, Google announced more searches were taking place on mobile devices than on desktops. The shift in the devices used to access the Internet has been shifting to mobile for a number of years, and searching may be the area most businesses ignore the most. It’s not enough to just have a mobile-optimized website that fits into Google’s site requirements anymore. You must invest in positioning and advertising when reaching customers on search engines. You need to be at the top of the first page of Google to get recognized. Now shrink those search results on a desktop browser down to a mobile phone screen. Your opportunity to be seen starts to shrink as well. It’s incredibly important to purchase the advertising needed to be seen first on the search results. Buying keywords, geofilters, etc., are investments you can’t dismiss. They will be impactful on the number of customers you are able to reach. And as you invest more in this strategy you will learn and evolve as technology changes. This prepares you for a longterm strategy. The conclusion to draw from all this is that mobile is the dominant, preferred path your customers are using to seek you out. Creating an experience that ties all your marketing channels into a mobile-centric resource for your customer and potential customers is not just a great suggestion, but it’s vital to your future success.